There’s been a lot of hubbub about mortgage rates since the start of the year. It’s not unwarranted, given the fact that 30-year fixed rates increased from 3.95% to 4.46% from January through early March, per Freddie Mac data. But they also dropped last week for the first time all year – so it’s possible we’re beginning to see a plateau after a few stressful months. And history tells us that periods of rapid increases are often followed by declines, meaning relief might be in sight for those affected by the supposed carnage. Forget 5%, How About a 9% Mortgage Rate? 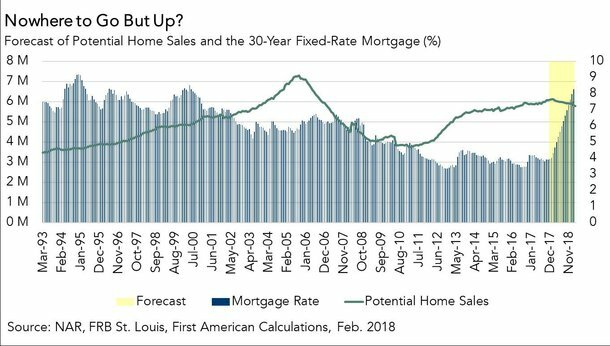 Now let’s talk about that headline – what would happen to residential home sales if 30-year fixed mortgage rates doubled from around current levels of ~4.5% to 9%? This assertion comes from First American (a title insurance company) and its chief economist Mark Fleming. He compares the unlikely scenario to actual events that took place between 1977 and 1981. During that period, mortgage interest rates rose from 8% to 18%, which is actually a 125% increase. It was the most “dramatic increase” in rates in 50 years, and in 1980 alone, rates shot up 50% year-over-year. As a result, single-family home sales plummeted 36% between 1979 and 1981. Could the same thing happen today? Apparently, no. First American modeled it out using their proprietary Potential Home Sales algorithm and found that a doubling of interest rates from current levels would actually only lower home sales from a 6.1 million seasonally adjusted annual rate (SAAR) to 5.8 million SAAR. That’s less than a five percent decline, or 300,000 fewer homes sales. Sure, it would hurt, but it wouldn’t be in the same galaxy as the calamity that took place about 40 years ago. And the odds of mortgage rates actually doubling from current levels is very unlikely. In fact, the last time they were that high was back in 1995, nearly 25 years ago. So why will it be different this time? Well, because economic conditions are strong, which is why interest rates are increasing in the first place. A growing economy coupled with low unemployment increases the risk of inflation, and as such the Fed takes action to raise rates, which has the potential to trickle down to other lending rates, like those offered on mortgage loans. But solid economic conditions also mean prospective home buyers have increased borrowing power to keep up with any rate increases, which explains why interest rates affect real estate prices in strange ways. 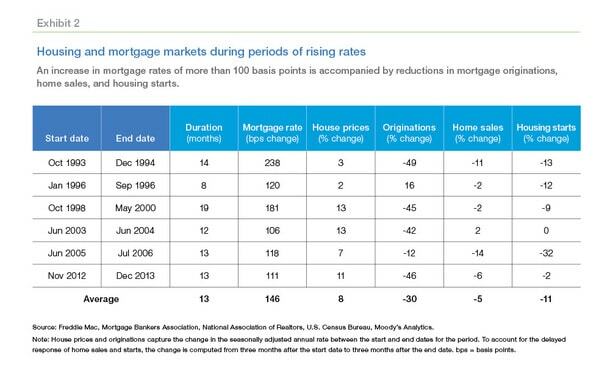 Notice the chart below from Freddie Mac; home prices went up during all periods of rapidly rising interest rates. Fleming argues that “our housing market is well positioned to adapt to rising mortgage rates,” taking into account existing-home sales and their historical relationship with demographic data, labor market conditions, incomes, home price trends, and the health of the overall financial market. At the moment, existing-home sales are underperforming their potential by 3.4%, or an estimated 210,000 (SAAR) sales. This is actually good news because if existing-home sales are exceeding potential home sales, there is a higher likelihood of a market correction as the level of turnover isn’t supported by market fundamentals. Instead, it might be driven by risky financing, as we saw in the early 2000s when zero down mortgages and interest-only mortgages were the only game in town. Ultimately, if the economy is doing well, the housing market should follow suit, even if homeowners are getting saddled with higher mortgage rates. And with housing supply so low at the moment, and showing no sign of letting up, don’t expect a deal if rates do rise – expect an even higher monthly mortgage payment.